Hello Architects of Central PA. I’m proud to be serving as your AIA chapter president in 2016. This year brings with it an opportunity to grow and excel in the provision of services that are being offered to local AIA members. Our chapter is in the midst of executing a strategic plan that promotes continuity among the services being provided locally. Even though our board has the luxury of building upon a solid foundation laid by those who came before us, rest assured that the energy level and desire for improvement is as high as ever. A primary challenge facing all state and local AIA chapters in 2016 is to ensure that we are in compliance with the core member services program initiated by AIA national. AIA Central PA is well positioned to accept this challenge. For years AIA Central PA has been deeply involved in growing programs that serve our region. Communications in the form of a newsletter and email blasts have consistently kept our members informed about local happenings and opportunities. 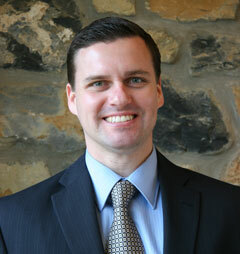 In addition, we have developed a lecture series that has drawn nationally awarded speakers to Central PA. In 2015 those speakers included Tod Williams and Billie Tsien, along with David Jameson. The AIA Central PA Conference and Expo consistently provides a forum for learning credits, access to quality vendors and professional interaction. The conference also provides a venue where design awards can be presented annually. The communications, lectures and conference form a strong base for the services provided by our chapter, but we also have committees that initiate events and services related to emerging professionals, membership, community outreach and government affairs. All of this being the case, when the AIA Central PA board evaluated the national core member service requirements we were pleased to find that we are excelling in every category. However, complacency isn’t part of our plan moving forward. Our strategic plan involves refining every facet of the services we currently provide. Change is the only constant, so keep your eyes open for changes in 2016. One such change is taking our board meetings on the road. We will be hosting our quarterly board meetings at firms all across Central PA. Our hope is that this will give members a chance to engage with the board and promote involvement by a greater cross section of members employed by a variety of firms. Prior to getting involved with our outstanding local chapter I recall asking and being asked “what does AIA do for us?” Well folks, in Central PA one needs only pay attention and tune into the array of services being offered. We are truly fortunate to be part of an extremely active architectural community and a local AIA chapter that is a cut above the status quo. The 2016 AIA Central Pennsylvania Lecture Series committee is excited to announce our next lecturer! We will kick off the 2016 series on Thursday, May 12th in Lancaster with Jonathan Segal, FAIA. 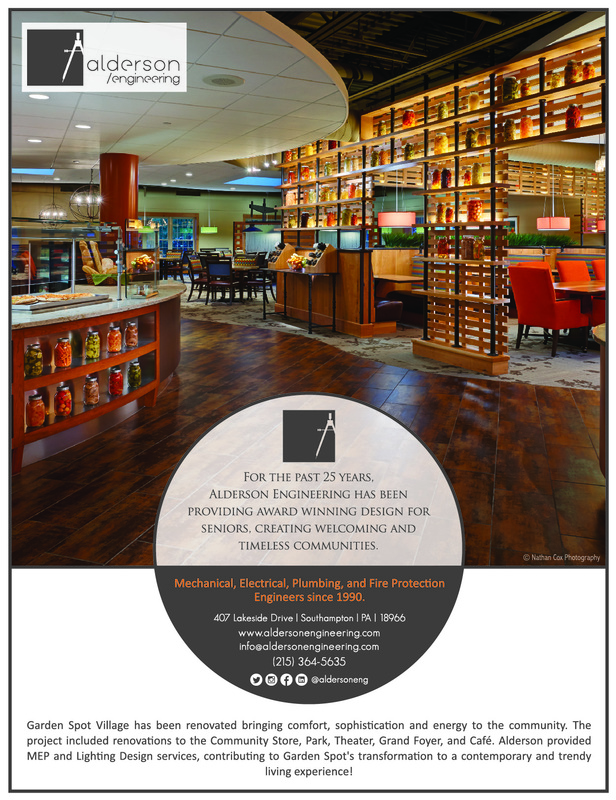 Jonathan will make a presentation about the work of his San Diego based firm at 7pm at the Armstrong World Industries Corporate Campus. 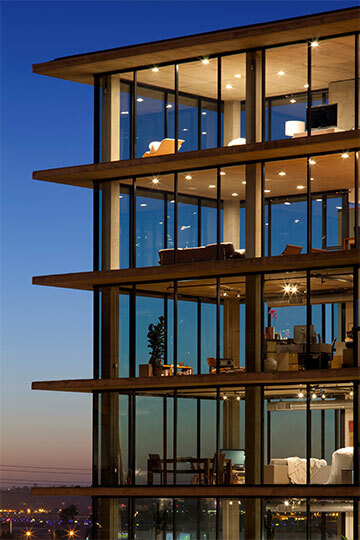 Segal’s firm and development company have been responsible for the design and development of over 300 urban residential, mixed use, and live/work construction projects, winning numerous accolades including 6 AIA National Honor awards. Segal will speak about his “Architect as Developer” process and how it allows the architect to gain control of projects, thus helping to create better environments and communities as well as giving the architect better financial and creative satisfaction. You have the opportunity to earn 2 CEU’s at this event! Armstrong World Industries will be offering a 1 CEU course prior to the lecture, and the lecture has been registered with AIA to for 1 CEU. Registration for the lecture and CEU will be available soon. Check the AIA Central PA website and upcoming mailers for more information. Submissions accepted until 4:00pm, July 25, 2016. In addition to the digital submission, each entrant is required to submit a presentation board to be displayed at the Awards Presentation Ceremony. In addition, each entrant may submit an additional presentation of any medium (model, video, etc.) for display at the Awards ceremony. Each presentation may be comprised of drawings, models, photos, prints and other information to describe the projects. Firm identifications should be included in the presentations. Board Presentations are due to the AIA Central Pennsylvania office (240 N. Third Street, 12th Floor, Harrisburg, PA 17101) by 4:00pm on Tuesday, September 27, 2016. Firms may bring the presentation boards to the Design Awards event but they must be received by 12:00pm. Additional presentations of other medium may be brought directly to the venue prior to the event. Entrant must confirm with AIA Central Pennsylvania prior to the event to ensure space is reserved for their presentation. The city of Detroit, Michigan hosted the 2016 AIA Grassroots Conference. I was honored to attend my first Grassroots conference on behalf of the Board of Directors of AIA Central Pennsylvania, along with our Chapter President, Daniel R. Godfrey, Jr., AIA. On Tuesday evening, the conference kicked off with a welcome reception on the 72nd floor of the Renaissance Center, an ideal venue to take in all of Detroit and beyond. With a busy day ahead of us, the reception provided time to informally meet other AIA Chapter Leaders across the country and share ideas. Leadership workshops occurred before and after lunch. One standout workshop was presented by Bill Pawlucy, CAE, called Great Board, Great Direction: Board Roles and Goals. While this was a “back-to-basics” review of a board’s organization, it was extremely informative, especially with a wide variety of attendees ranging from board members of all levels, to several staff members. When leadership workshops concluded for the day, regional meetings were held. Our AIA Pennsylvania Board President Elizabeth Masters, AIA, led an informal discussion on the efforts of AIA Pennsylvania over the next year. One topic that we discussed was how to connect with architecture students early on to emphasize the importance of the AIA, and more importantly, how to stay in contact with them after graduation through their professional development. 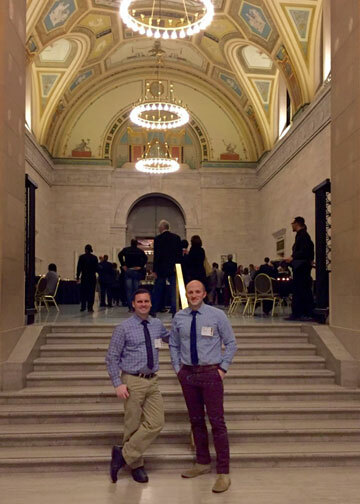 Wednesday concluded with a reception at the Detroit Institute of Arts. Many galleries were open for us to visit, and the reception was surrounded by Diego Rivera’s mural walls named Detroit Industry. 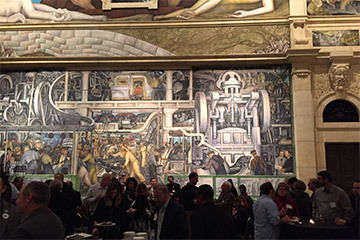 The murals consist of 27 panels which pay tribute to the automotive industry of the 1930s. Due to the threat of severe weather we had to cut our trip short and missed the last day of workshops. While this was unfortunate, we still left the conference with lots of great information to bring back to the AIA Central Pennsylvania Board of Directors. This was the first year that AIA Grassroots has been held outside of Washington D.C. While some attendees expressed dissatisfaction with this strategic move by AIA, it seemed fitting for the event to occur in a place like Motor City, where such a recent revitalization movement has occurred. As many of you were aware, Architect’s Action Day was on March 23rd this year. 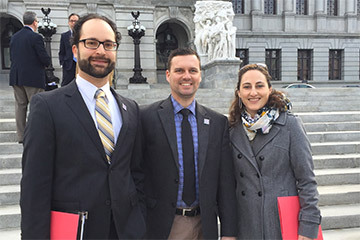 This annual event is organized by the State AIA and focuses on getting AIA members in front of their Pennsylvania Representatives and Senators to discuss issues that matter to Architects. By participating in this day our members have the ability to directly impact political decisions and have their voice heard as a representative of the AIA. Having participated for many years now I can say that it is an important and rewarding experience. Below is a list and brief summary of subjects that were discussed on the 23rd. Follow up is always important. If any member wishes to meet with their Representative to discuss any of these topics but were unable to attend Action Day please reach out to the AIA Central PA Board. We will assist you in scheduling the appointment and have a repressive from the board join for the meeting if desired. It is the AIA PA’s position that Pennsylvania should adopt the 2012 or 2015 version of the International Building Code. This should be done for several reasons including health safety and welfare, as well as improving the minimum standard for building performance. AIA Pennsylvania recognizes that continuing education in architecture is crucial to the advancing and improving of the profession. Senate Bill 642 amends the Architects Licensure Law by adding language requiring each licensee to provide certification of successful completion of a minimum of 24 hours of continuing education as a condition for renewal of the biennial license. AIA Pennsylvania supports governmental policies, programs, and incentives that encourage energy conservation as it relates to the built environment as well as the development and harvesting of energy from renewable sources. 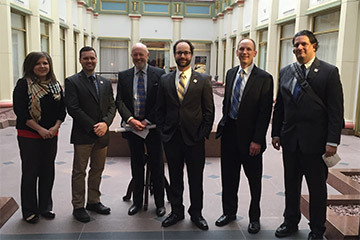 AIA PA supports House Bill 2030 which encourages steps to a more sustainable built environment and a carbon neutral Pennsylvania by 2030. Student debt is one of the most critical issues facing the next generation of design professionals. AIA Pennsylvania supports legislation that eases the burden by providing loan assistance to architecture students and recent graduates who contribute their design services to underserved areas. As a result, communities would receive a broad range of architecture services that may not have otherwise been available, and architecture graduates would be able to get valuable real-world experience while lessening their debt. Architects and engineers are at a legal disadvantage in PA if they are not paid by the general contractor who hired them. House Bill 430 expands the Mechanics’ Lien Law to add design professionals as a group that would be able to place a lien on a property if they are not paid for their services. Architecture can improve student success and health through thoughtfully designed buildings and spaces that enhance learning outcomes. AIA PA is supportive of the state funding for school construction, but the current PlanCon process is lengthy and burdensome and must be streamlined. AIA PA believes that the PlanCon borrowing plan proposed in HB 762 offers the unique opportunity to clear out the current backlog of reimbursement and satisfy the already incurred financial obligations of the commonwealth. It also provides the opportunity to craft a reformed, efficient and streamlined process for school construction and renovation reimbursement going forward. 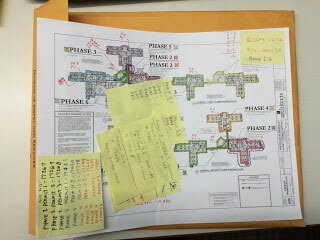 This is how I tracked the phases and permits on this first job. Once, a building official requested that a complex and lengthy renovation be split into individual permits for every phase. Not only that, but each phase (all but one) was split into additional permits based on differing occupancies in the various phases. 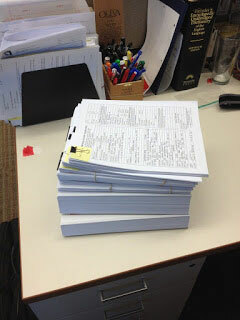 So in lieu of one permit application that contained many phases, we ended up with eleven permit applications. Some of the permits were not be applicable for years from the filing date, but we were asked to submit them all at once in order to remain under the same state building code addition. Needless to say this caused an unprecedented amount of paper work and stress, along with “Frankensteining” building sets together that weren’t anticipated in being submitted together. It took more than 4 years to close out all those permits. My next project (in another state) was already completed and required, of course, a building permit application. This was a small project and thankfully just one phase. 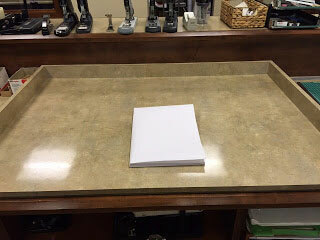 However, another unusual request was made that we fold, not roll, the permit sets. 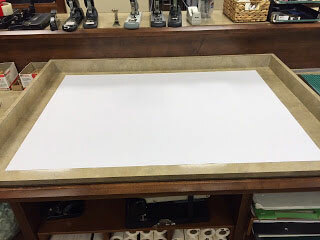 I did not appreciate the repercussions of this request until I realized we had 60 drawing sheets. The building official claimed that they did not have the facilities to store rolled drawings. If they had storage problems, I may have respectfully suggested that they not require four sets, which is double the normal amount. At any rate, I discussed with the official which kinds of sheets I could omit from the set. I ended up removing many of the casework details and food service drawings. I believe I removed about 10 drawings total. When it came time to ship them, it was the day of reckoning. I had not, up to this point, tried to fold a set this big before. 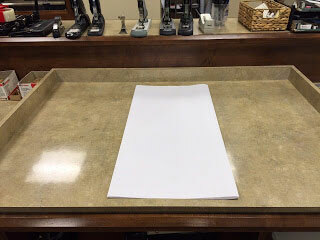 I had heard on an episode of Mythbusters that it was impossible to fold a piece of paper more than seven times on itself. Well, I was ready for fifty sheets together. I intended to ship the four sets in an 11 x 17 paper box. I first tried folding the sheets in fourths, but it became unruly very quickly and I was only half way to getting the set small enough. 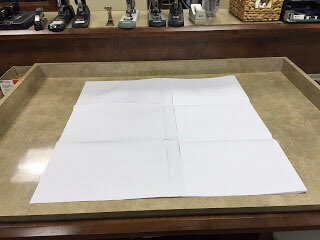 So I tried folding the 30 x 42 sheets into thirds the long way. 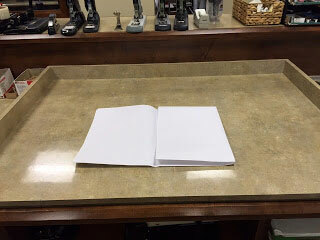 That way the paper was not yet folded upon itself. Next the drawings were folded in thirds the opposite way, such that there was only ever one seam crossing another. It was not pretty but it was folded. It was actually a two man job, with my co-worker providing the rest of the muscle. By the time we were done, it was time to get all four sets in the box. It seemed to take a half roll of packing tape, but the lid was secured. I was just glad I was not the one who had to open it for fear of it exploding once the tension of the tape was breeched. 10 x 14, now imagine 50 sheets and then times 4 sets. Applications for just one building type on the campus. My final example required the most number of permits I’ve ever encountered. When designing a campus of various housing options including semi-detached homes, small five unit apartments as well as two large buildings as part of the same project, we encountered permit-shock. There ended up being twenty-four structure permits, including one for each of all of the above plus carports and garages. Also, retaining walls need their own permits, so six more. Oh, and each old building that had to come down needed a demolition permit, so thirty five more. Add in the fire line, grading, other plumbing and utilities, we were staring at seventy plus permits. I do believe I spent a total of at least two weeks coordinating just the permits. Fast forward several years, and there remain just two open permits on the project!